Find a vacation home to rent in Starogard County from our list of vacation rental properties. 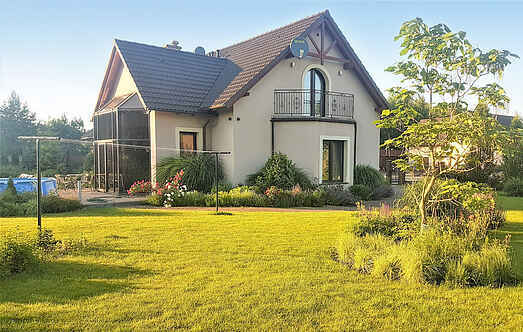 Campaya has over 11 vacation homes available in Starogard County, which give you the possibility to locate a unique accommodation in Starogard County which completes your check-list in search for the perfect self catering vacation apartments in Starogard County or vacation villas in Starogard County. This modern holiday home is located in Zemun. The house stands on a large, enclosed and beautifully decorated property with a gazebo, a barbecue area and a pond. Lovely cottage in Szteklin, in a recreation area. It is simple and practical furnished. The cottage is a garden where you can relax and unwind is. This beautiful stone house is located on the property of the landlord and has an open terrace. The home is modern and comfortably furnished. Water is also from a purely natural source. This cosy wooden home on the edge of the forest has a conservatory and a balcony. Enjoy a view of the forest and the lake. A steep staircase is available in the house.